The stats are in! 2018 is officially the BEST year in the history of Denver real estate! 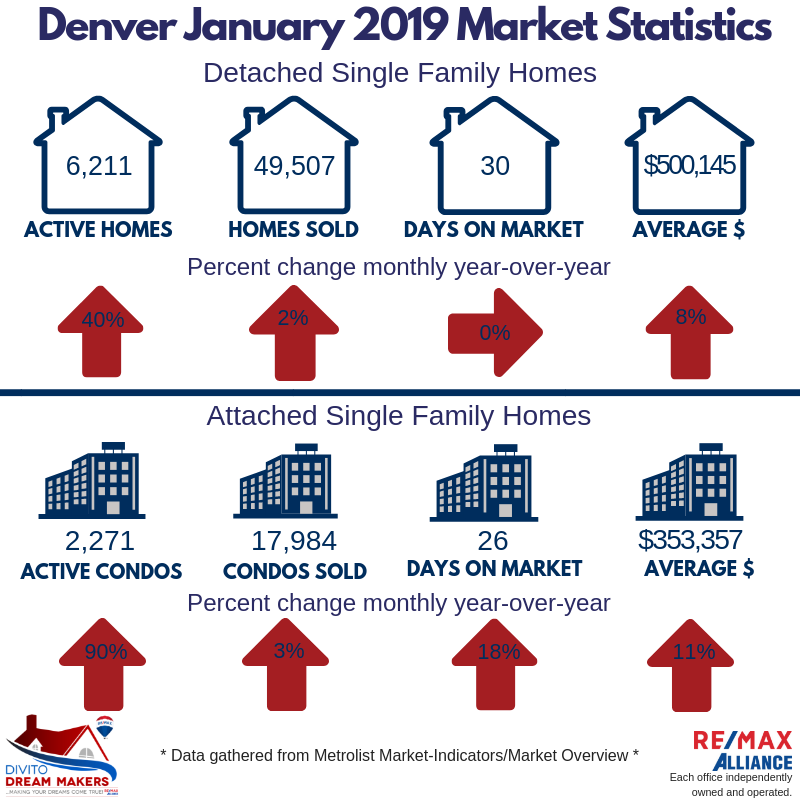 In 2018, the Denver Metro area sold more houses and condos at the highest average price ever. While detached and attached single family are both up sharply, this fact has allowed for an increase in sales to occur. In 2018, the marketplace absorbed an average of 4,125 single family detached homes and 1,498 condos each month. A balanced market in Denver would have 6 months supply of inventory. Based off current numbers, we need 24,000 single family homes and 9,000 condos to be active for sale to achieve balance. With only 6,211 houses and 2,271 condos for sale at year-end, we are many moons away from achieving a balanced market in spite of how it may “feel” out there in practice. DiVito Dream Makers has been saying – throughout Q4 of 2018 – that consumers are “drunk” on the low interest rates of the past decade. They are having a hard time getting their heads around the slight rise in rates and what the implication of this increase mean for their family budgets. But by any measure, borrowing money at 5 percent is great money, and we will sober up soon! Additionally, it’s true, that the fever-pitched pace for which we were seeing multiple offer situations have slowed. But rest assured, they are not gone and the spring compression market is just around the corner in 2019! Mortgage applications are up this week 23.5 percent, rates have seemed to settle in a little, and consumers are feeling more confident now that the 2018 mid-term elections are behind us. Nearly 50 percent of homebuyers are buying properties between $300K and $500K, and we predict this price bracket will remain the sweet spot in 2019. If you ever want to digest/analyze the market or market conditions with us, simply contact DiVito Dream Makers! Let’s have another great year in real estate!